Tony is committed to helping his patients care for their smiles and reduce unnecessary treatment. As such, we take great pride in offering therapeutic and protective appliances to extend your oral health. Participating in sports calls for the right equipment and protective gear. Don’t forget about your smile. A custom-fitted athletic mouthguard will feel more comfortable and protect your teeth better than something you can buy at the supermarket. In fact, it may even help to reduce the risk of concussion. Chronic clenching and grinding of your teeth (bruxism) can lead to jaw pain, broken restorations and a worn-down bite. If you notice that you wake up in the morning with a headache or sore jaw muscles, let Tony know. 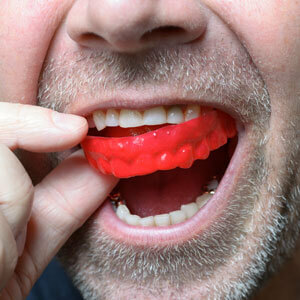 Wearing a nightguard can protect your teeth and relax the muscles, by increasing the resting space between your jaws. By doing so, you can also extend the investment that you’ve made in treatments such as crowns or veneers. If you need to replace all your teeth at one time, dentures are one of the most affordable solutions. Tony will take an impression of your mouth to have a custom set of dental prosthetics made. We can even specify the colour, shape and size of the teeth. Be sure to ask about implant-retained denture options, for people who struggle with a secure prosthesis fit. These designs can be removable or permanently affixed to the implant abutments. Trinity Beach Dental is always happy to welcome new patients and their families. We pride ourselves on running on time so that you’re not left wasting valuable personal time. Contact us today to schedule a complimentary smile makeover consultation!